Another cold and flu season is upon us and there’s no better way to feel better than some homemade soup. Everyone who knows me, knows that I love to cook, and those same people also know that while I will give anyone a recipe to anything I make… It isn’t always so simple because I don’t always have them written down. (And then I hear “so.. I don’t measure anything? Just toss it in? And cook it for how long? Until it’s done?? what kind of answer is that? !”😂😂😂)So Bare with me because this recipe is kind of one of those. But it’s worth it, and it’s very versatile. Also Remember none of this is set in stone so use whatever vegetables you have on hand, whatever spices you like and season it to taste. *Spices will basically be up to you in this recipe. 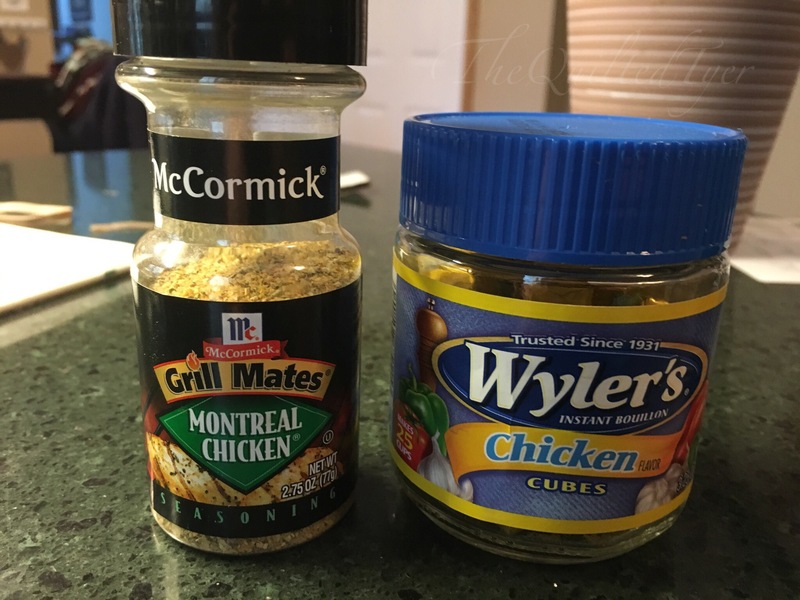 For example here I have used a couple chicken bouillon cubes and some Montreal chicken spice and while I forgot to pick up fresh ginger from the store.. I use a dash of powdered. 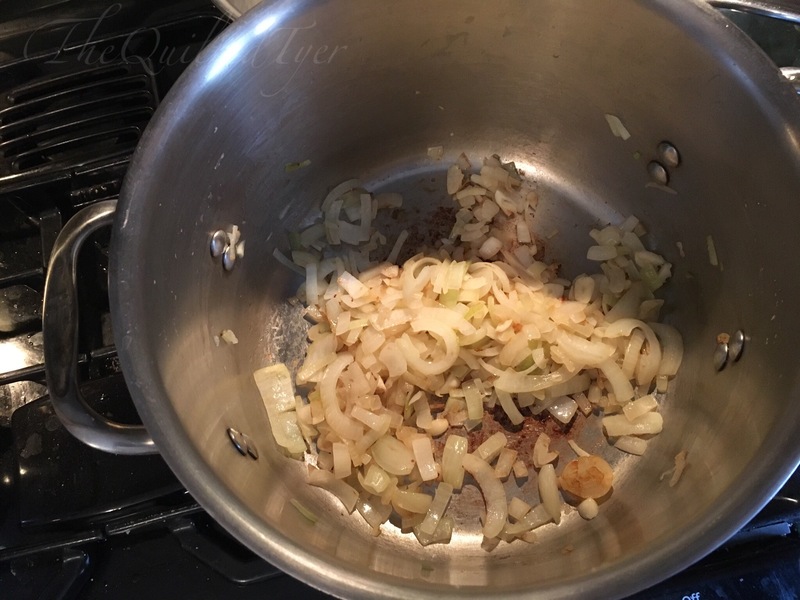 Sauté the chopped garlic and onions in the bottom of a big pot, make sure it’s big because if you’re like me (and you’ll see a picture at the end) sometimes you forget how many vegetables you like in your soup. While those are cooking, chop up ALL the rest of your vegetables and put them into a big bowl. When it comes to chopping vegetables that you need to add all at once..
Place two big bowls in your sink. 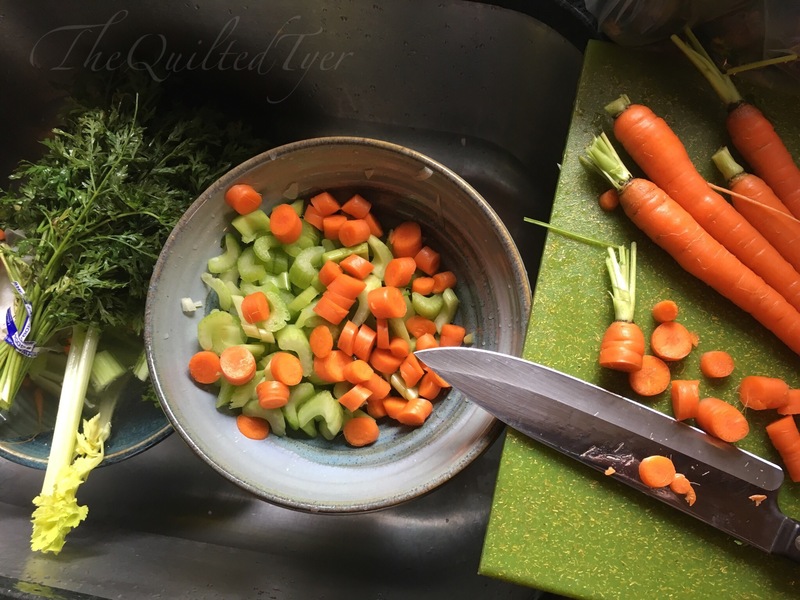 One for cut veggies and one for the compost; but prop the one that you’ll be putting the cut veggies in – up higher ( here I use an upside down cup to elevate the bowl ) and move it over just below that cutting board. 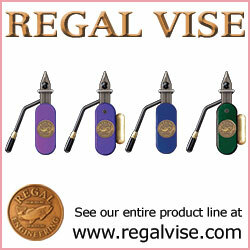 This will help streamline your chopping and gathering. Now you can chop chop chop, push them into the bowl and toss the waste into the other bowl. And you have chopped up a whole bunch of celery and a whole bunch of carrots.. 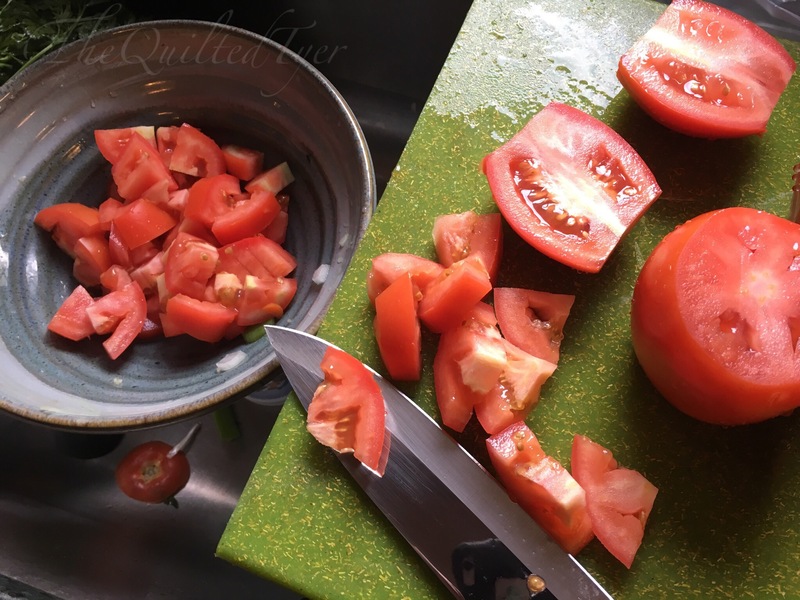 Finally, chop up your tomatoes. Here I used plum tomatoes and a few other tomatoes since I had some left on hand. 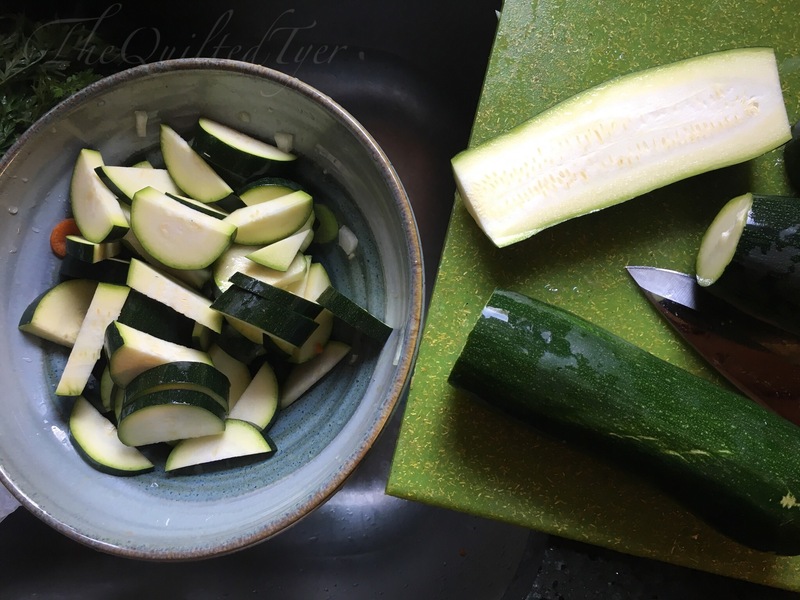 Chop them up a little large and throw them into the bowl. Remember: if there are any vegetables that you prefer, swap them out as this is personal preference. Now transfer everything you chopped into the pot and add enough water to cover all the vegetables and about an inch or two more. 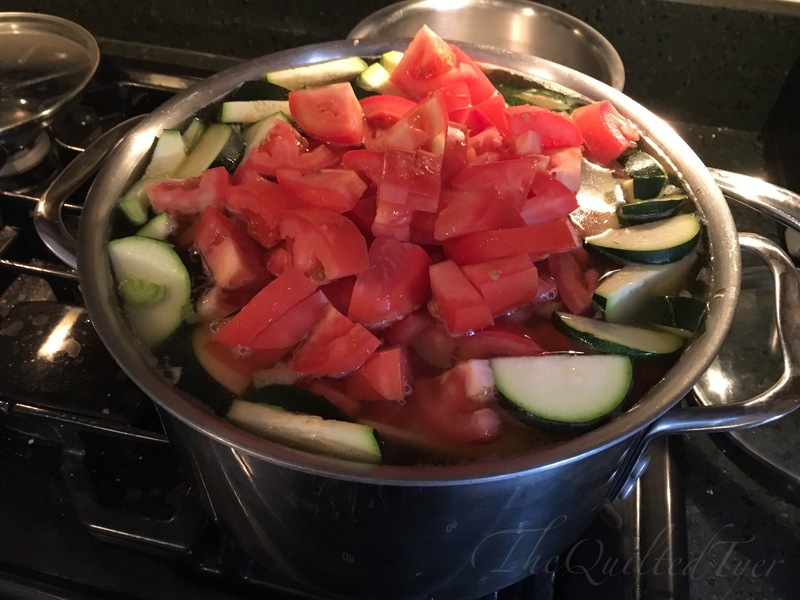 As you can see here… This pot is huge but apparently is not huge enough for all of these vegetables so I had to split it into two pots. 😑😂 Once you have (more reasonably) thrown all of your vegetables in, We will move onto adding some spices. Below you will see two things that I use. I sprinkle some of this chicken spice and add in about three cubes of the chicken cubes. Then It’s a dash of ginger or grated fresh ginger depending on what you prefer. Add those in with the veggies (seasoned to taste) and bring the soup up to a boil. Once its up to a boil, lower it down to a simmer and give it a stir once in a while. You want the vegetables to break down but not turn to mush so keep an eye on it as its cooking.I tend to check it every 15 minutes or so to see how the vegetables are doing. Once again I apologize as I cant give exacts with cooking time since it will vary on what you put in it, but plan on about 40 minutes total. I also do not cook barley in my soups as I dont like the “wallpaper paste consistency” in which cooking your barley in soup will give you. With that being said, let that cook and we will move on to the barley! 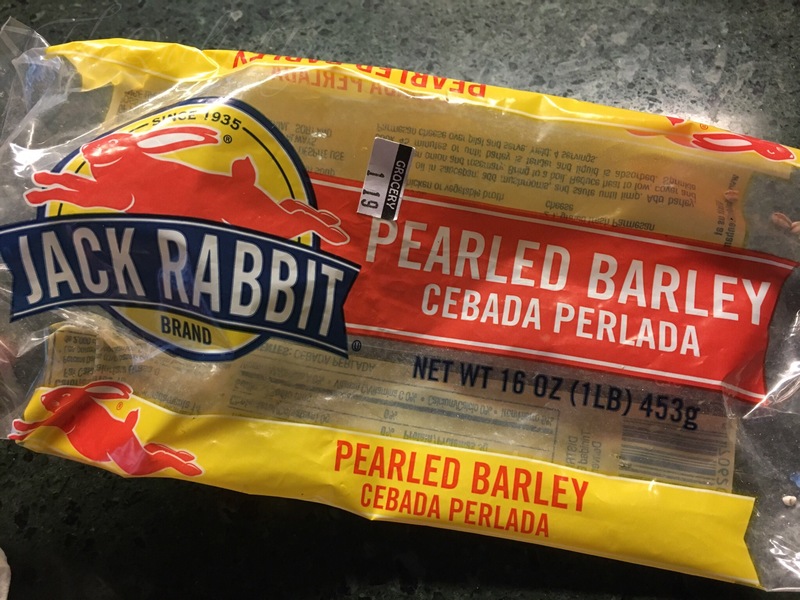 While all this is going on you need to boil the barley, and once you learn how to make a clear barley soup you may love it as much as I do. The straining makes a huge difference, as you can see the cloudy water left over would create an almost oatmeal texture in your soup. 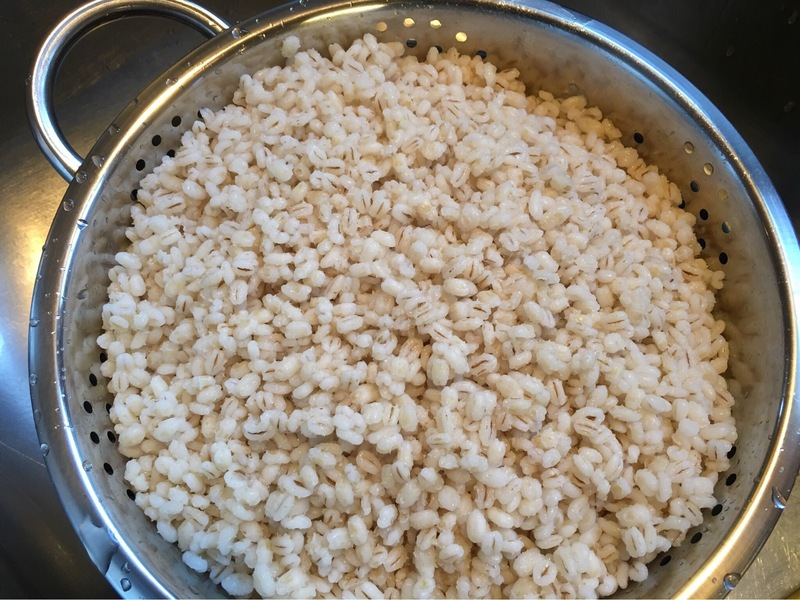 When it comes to cooking barley if you cook it IN the soup, the finished soup will take on the consistency of somewhat gluey oatmeal in the end. If you like that, awesome. 😂 but I don’t.You may have been turned off in the past on eating a barley soup because of that, But have no fear! Not anymore!What I like to do is cook the barley separate in its own pot, put it in a colander or use a big spoon rinse it and drain it. The best way to do this is to just put the barley filled colander over a pot and run cold water over it. 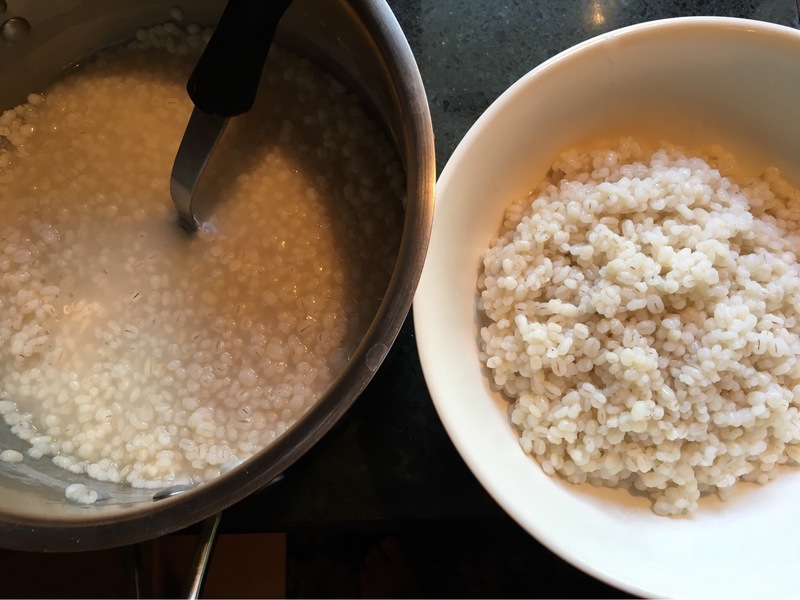 Pearl barley usually takes about 40 minutes to cook and that’s about how long it will take to make your soup, so if you cook these together in two separate pots, they will both be done at the same time. 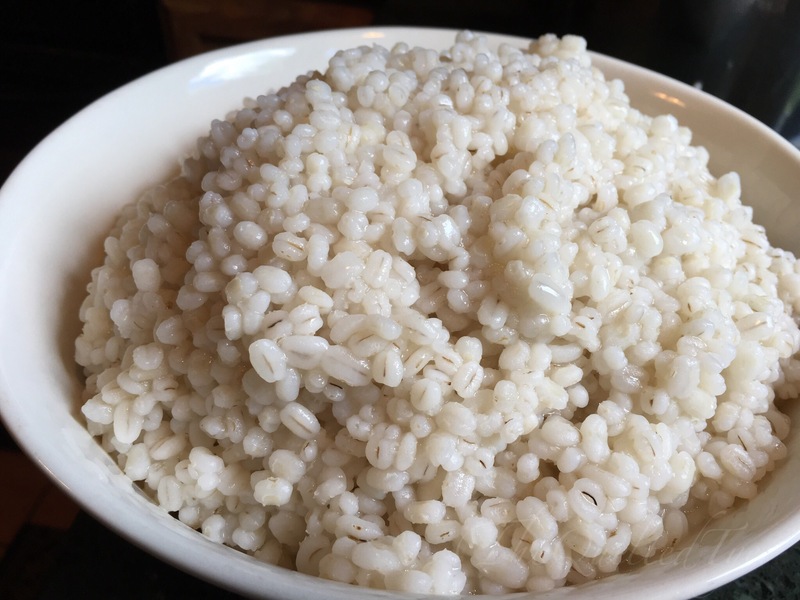 And then, right before serving all you have to do is take a spoonful of soup into a bowl and add a heaping spoonful of bright white coat pearl barley. Be sure to season the soup again to your taste in the end, before taking it off the stove.I omit the salt because it can be added at any time when eating. but you may want it so experiment! 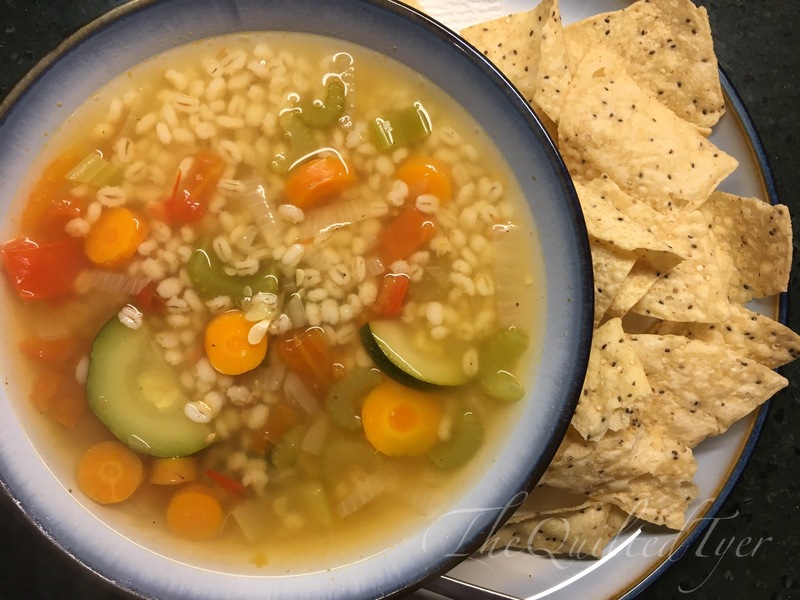 I hope you decide to whip up a batch of this soup soon as you feel any type of cold coming on, as it makes quite a large batch.Then just Add a scoop of the cooked barley to the soup right before serving with a side of chips or toast and enjoy.